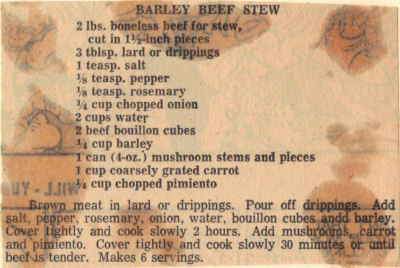 This recipe was clipped from a newspaper then pasted onto an index card, it was found in a large collection, date unknown. It’s pretty stained so it looks like it was a favorite. I’ve typed it below along with a scanned copy. Brown meat in lard or drippings. Pour off drippings. Add salt, pepper, rosemary, onion, water, bouillon cubes and barley. Cover tightly and cook slowly 2 hours. Add mushrooms, carrot and pimiento. Cover tightly and cook slowly 30 minutes or until beef is tender. Makes 6 servings.